To make sure you get the very most from your Veggie Cages, we'd like to tell you a little about how they work and how to make sure your tomato plants grow up strong and beautifully supported all summer long. The most important thing to note is that the Veggie Cage is more of a replacement for tying tomato plants to a stake than an actual cage. To make them work properly, you will still need to make sure that the initial stalks are contained within the rings. When you first extend and hold up the Veggie Cage, you may be surprised at how flexible and "springy" the Veggie Cage seems. You may even think, "How can something this flexible hold up a full-grown tomato plant?" But don't let the up-and-down flexibility of the Veggie Cage fool you. That's because the engineered design of the Veggie Cage means that it does not hold the weight of the plant and all those tomatoes up-and-down, but rather side-to-side. If you were to slide your forearms up inside the Veggie Cage and press outward, you'd see how rigid it suddenly becomes. That's exactly how it works in your garden. 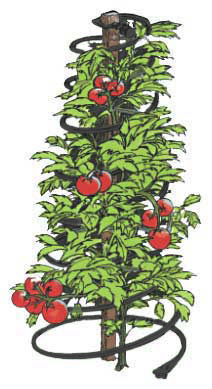 The main branches of the tomato plant lean out against the inside of the rings, and the Veggie Cage becomes "one" with the plant. The Veggie Cage functions as a truss or like a girder that connects the whole plant making a completely stable and strong "structure". You will love how simple and natural the spiral Veggie Cage really works. What's more, the flexibility allows the Veggie Cage to be stored nearly-flat at the end of the season; you need only to flip it upside-down to make it collapse. As your young tomato plants begin to grow, you'll want to give it a little "guidance" by tucking the main branches into the coils, when they are tall enough to reach them. Thereafter, you should take a look at your plants about once each week, to make sure that none of the branches are growing outside the Veggie Cage. Any loose branches should simply be tucked inside the nearest coil. As the plant gets taller and taller, you will need to do this less and less. By the way, the versitile Veggie Cage makes great plant supports for many varieties of flowers and vegetables. It is wonderful for growing snow peas, pole beans, clematis, dahlias, etc.